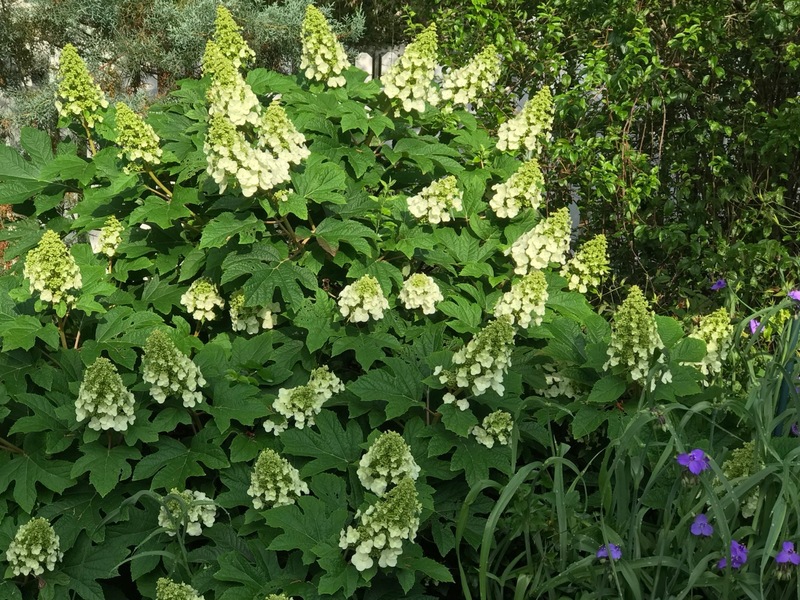 This entry was posted in garden and tagged cloudy sky, Lil' Ruby dwarf Oakleaf Hydrangea, spiderwort, wordless wednesday on May 23, 2018 by pbmgarden. 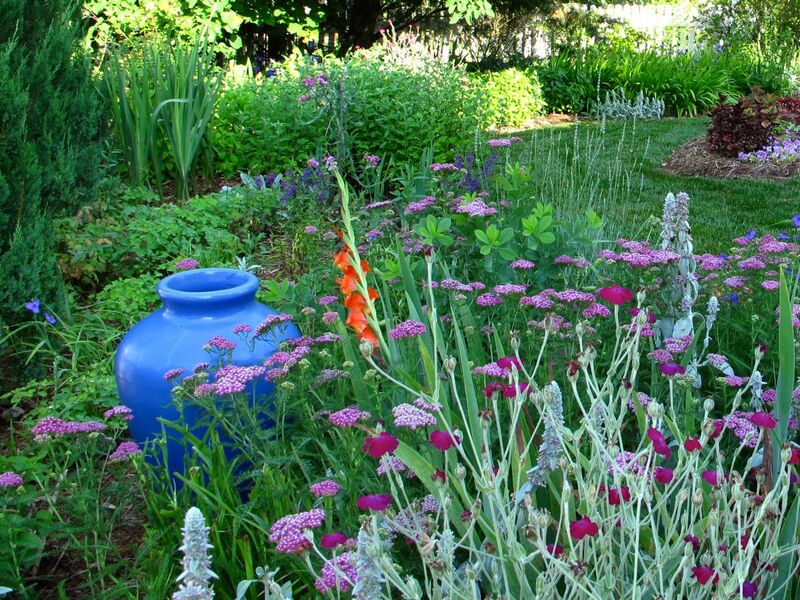 The garden at this point in June seems like an entirely new one—so different from the early spring palette. A salmon-orange Gladiolus from years ago brashly turned up in the Southern border today. I almost admired it for being so bold, but in the end I cut it and placed it in a nice vase indoors. 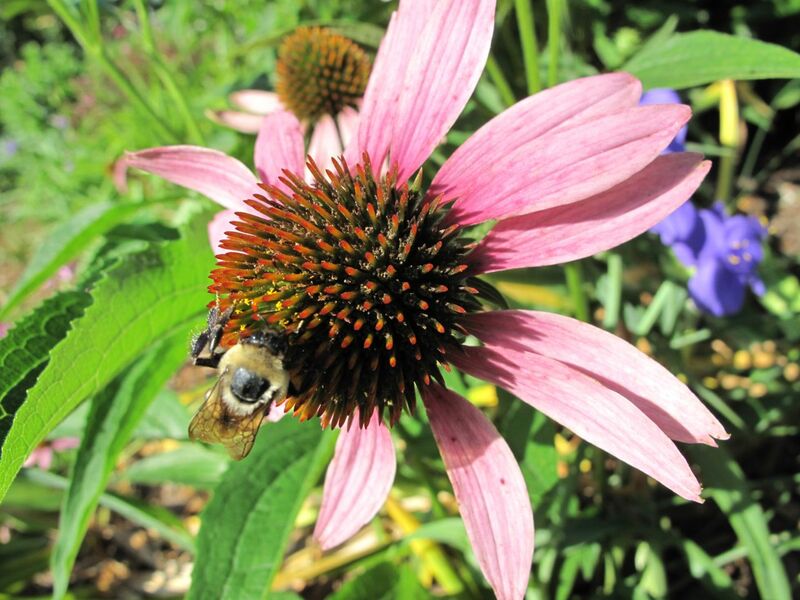 Beebalm is in full bloom, Echinacea is maturing in many parts of the garden and last year’s Allium ‘Drumstick’ is back. All are attracting bees. 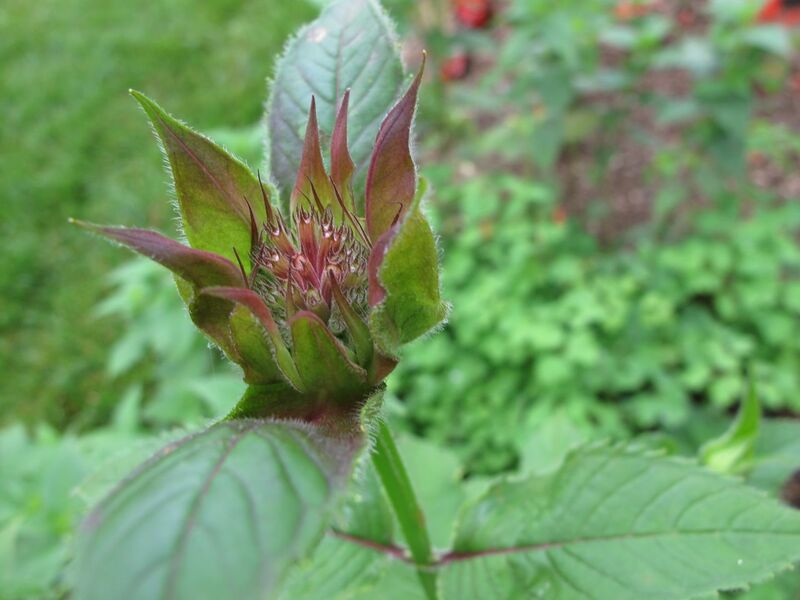 A hummingbird visited the beebalm yesterday. There have been a few other hummingbirds this year, but now that the beebalm is blooming perhaps there will be many more. A Foxglove mystery may be solved. This Foxglove has been in the garden since 2008 or 2009 and I thought it had caramel in the name, but never could find the tag. 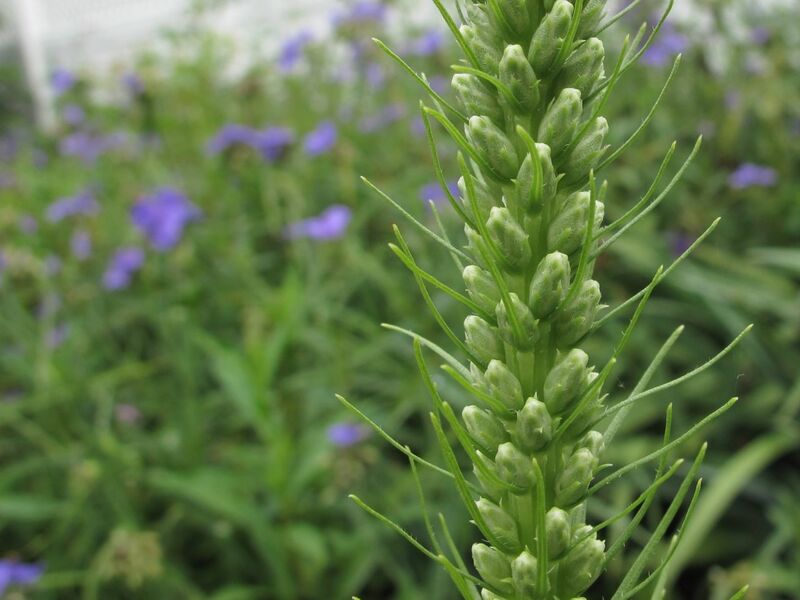 The coloring is creamy when the flowers first appear. 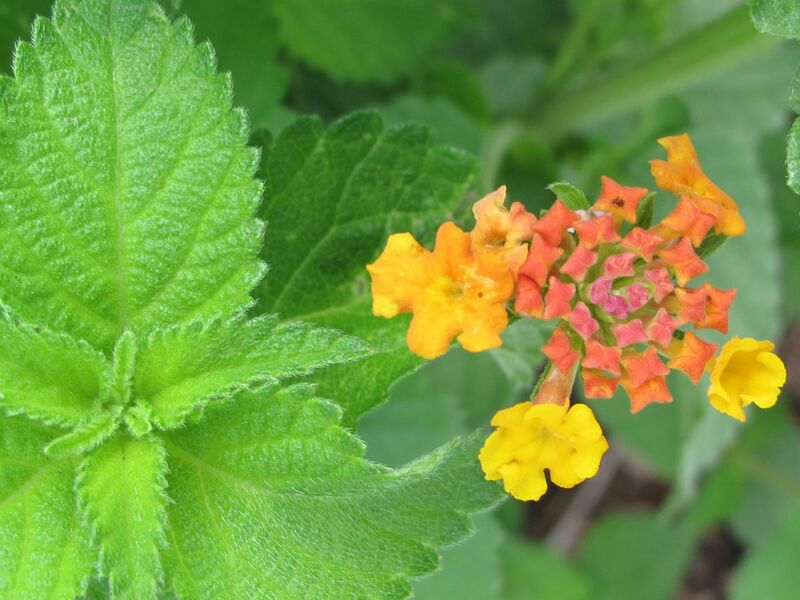 Inside the flowers are yellow with reddish-brown veins and a hairy lip. 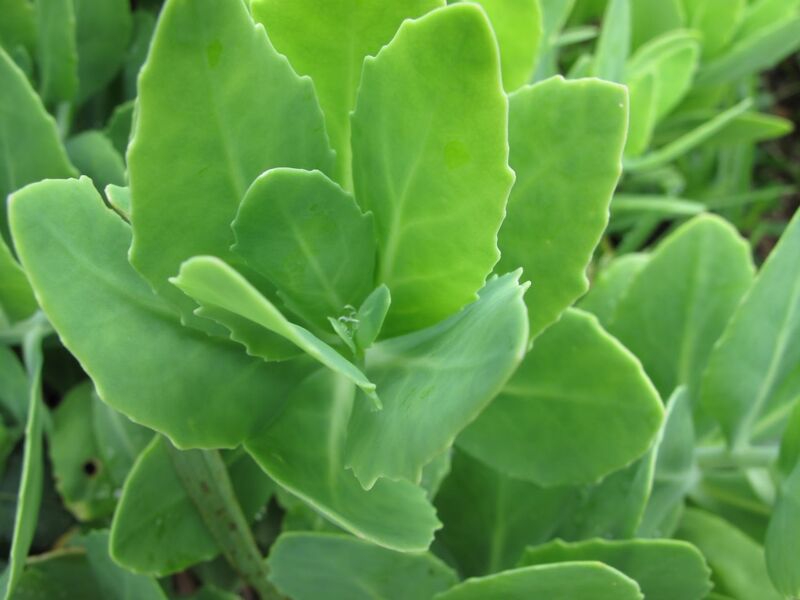 Today I researched it a bit and hope I have it identified properly now. Could this be Digitalis ferruginea (‘Gelber Herold’, ‘Yellow Herald’, Rusty Foxglove)? 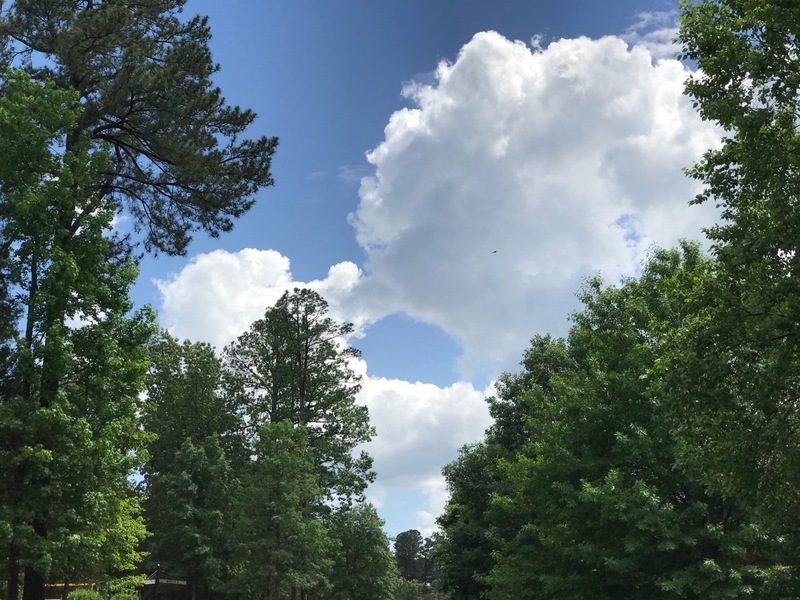 Today the weather was clear, hot and very humid, reaching 93°F. before severe thunderstorms passed through this evening. The winds overturned a bench and a flowerpot, but otherwise things seem ok for us. Some of our neighbors are reporting trees down, cable service lost and even roof damage. 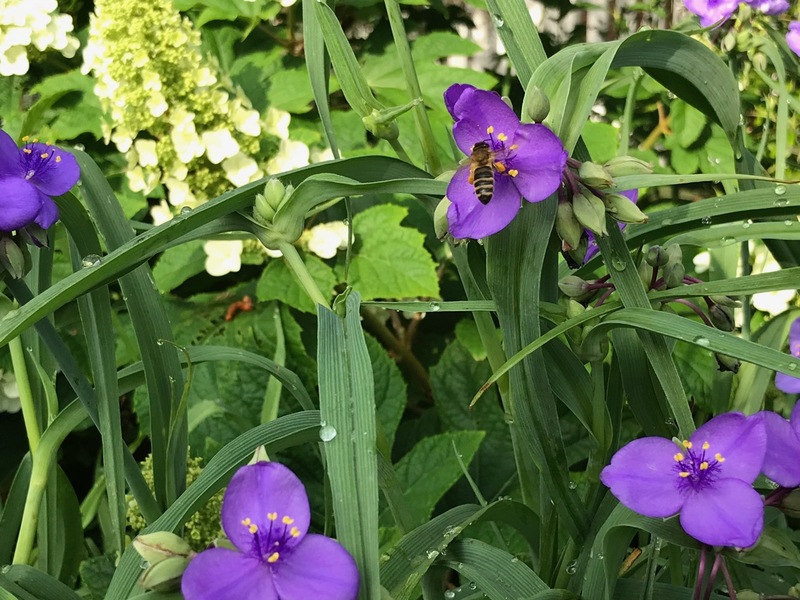 Despite the heat I chose today to dig up some of the dozens and dozens of Spiderwort that have aggressively expanded throughout most of the borders. 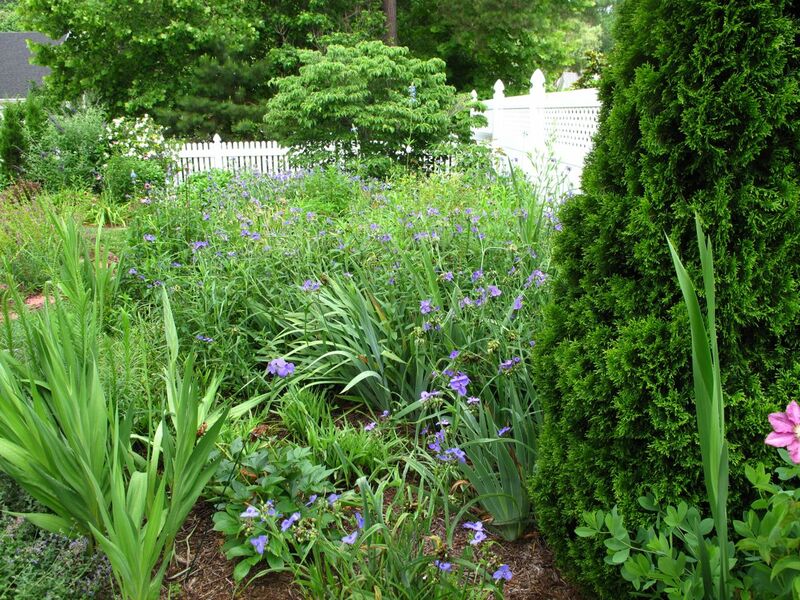 I had to dig up many irises in order to get to the roots of the Spiderwort, so now there is a lot of work to replant some of the irises and find a good home for the rest. Fortunately the high temperature tomorrow will be a nice 81°F. so the work should be enjoyable. 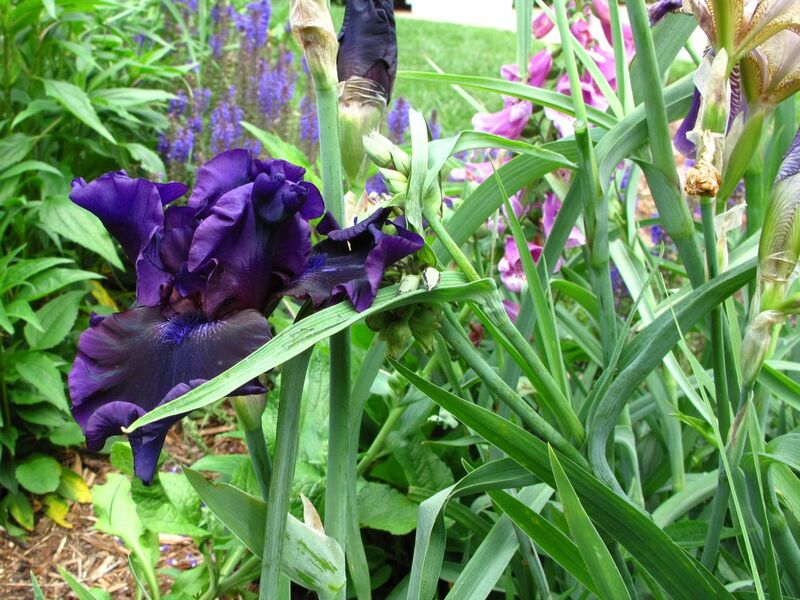 The irises have needed division for years, but actually they bloomed incredibly well this spring anyway. 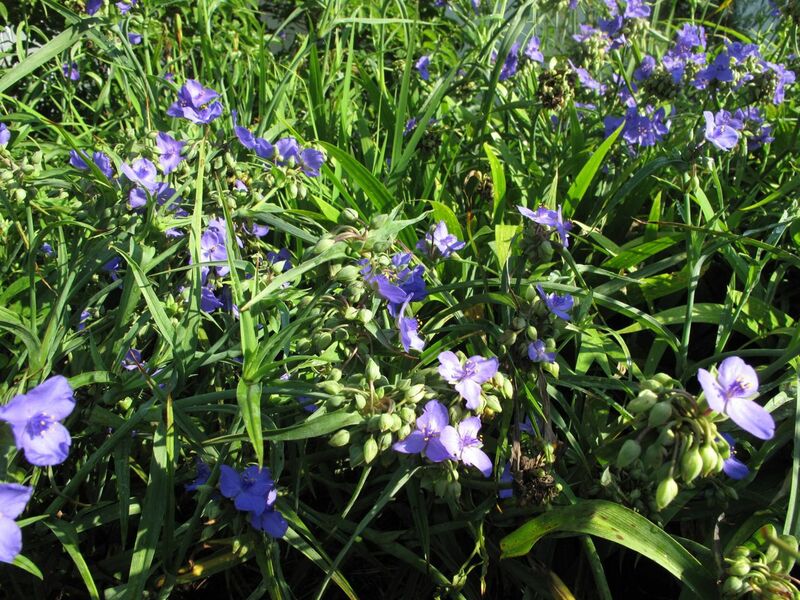 The amount of Spiderwort I managed to dig today is just a small portion of the total I want to remove. This white one looked so innocent and beautiful this morning. Actually this particular clump has not spread like the others, but it is getting very large. A variety of birds fill the garden with color and song. Fireflies or lightning bugs have been out in the evenings for several weeks. Frogs sing frequently and incessantly, though I have not seen one in the garden. 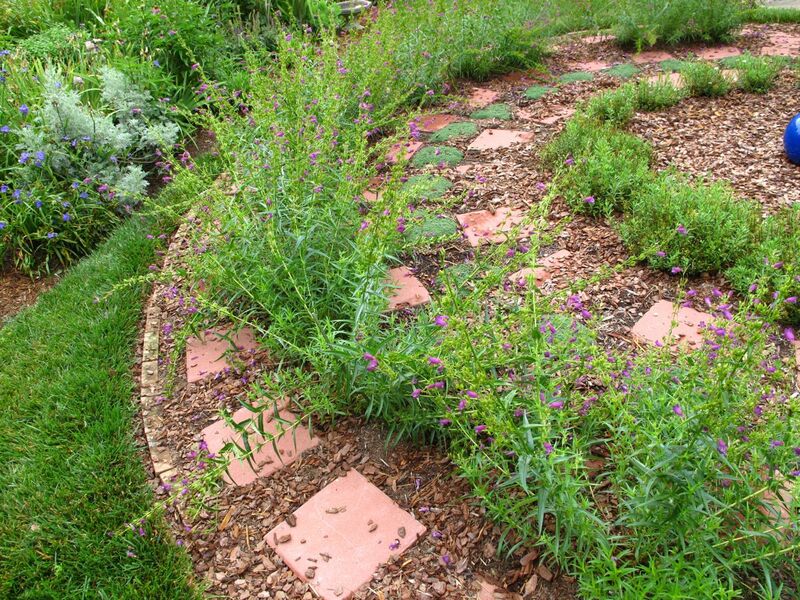 A couple of little bunnies are nibbling Thyme in the meditation circle. No sign yet of the 17-year cicadas. 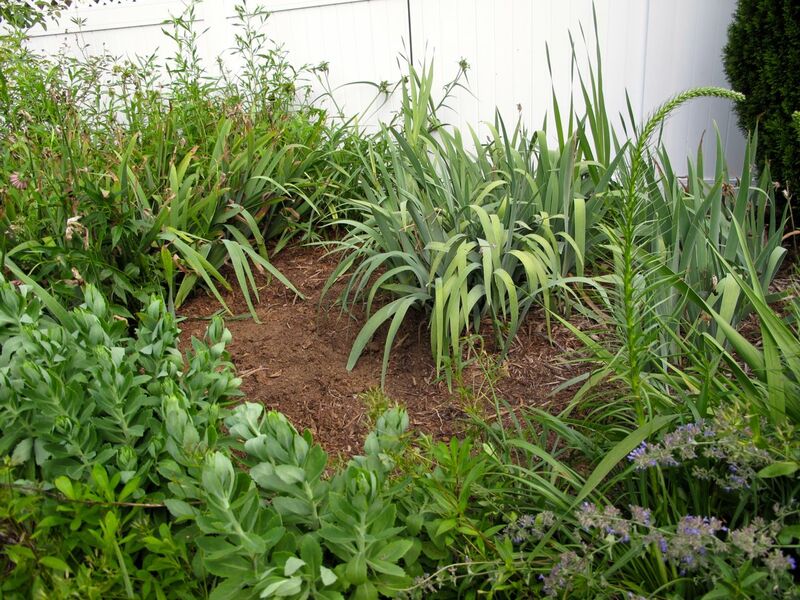 This entry was posted in garden and tagged Allium, almanac, beebalm, echinacea purpurea, foxglove, gladiolus, iris, june garden, monarda, spiderwort on June 13, 2013 by pbmgarden. It rained off and on all day and the outlook is the same for tomorrow. I’ll need to schedule some time for straightening and pruning after a fierce thunderstorm passed through last with heavy wind and rain, soaking the garden and sweeping over the catmint, roses and scabiosa. Fortunately the peony buds withstood the battering. Actually almost everything was fine and I am very happy with the way the garden has come together this year. 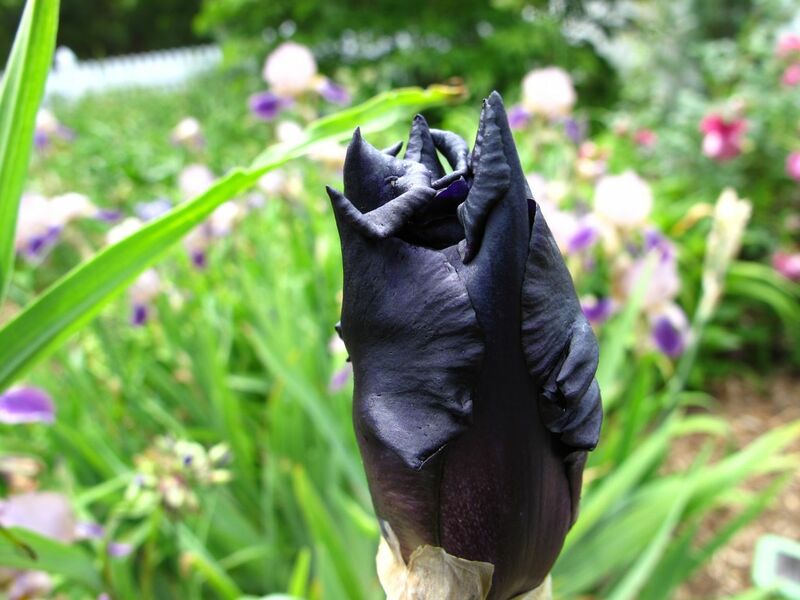 The first bloom on the black iris appeared today. 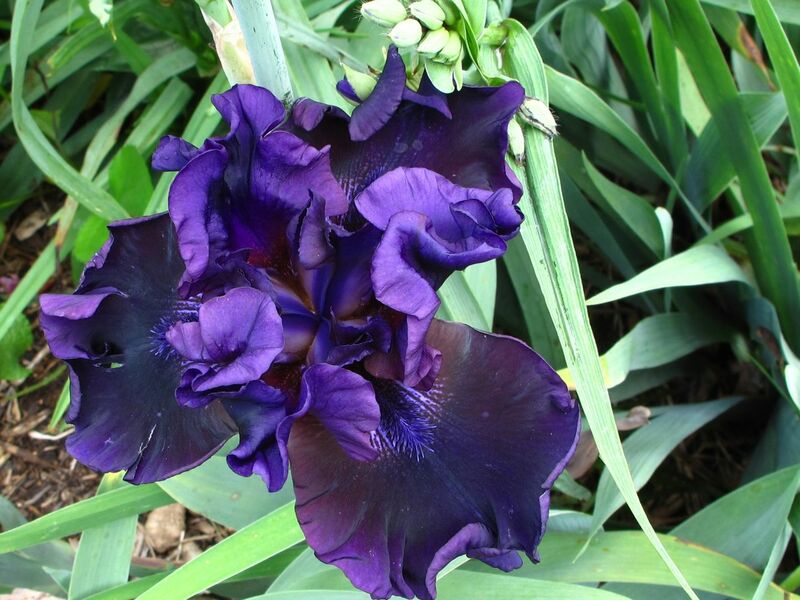 The standards of this enormous ruffled flower are very deep purple, the falls are inky dark. 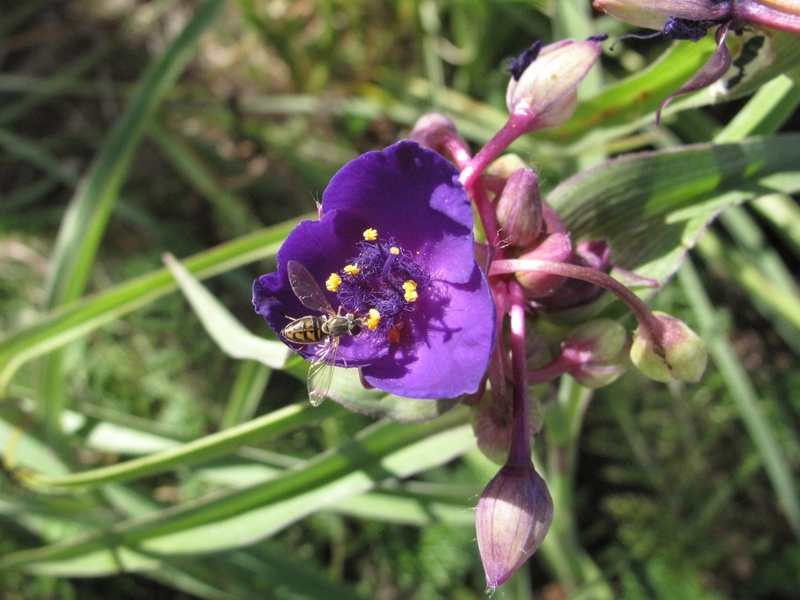 Despite ongoing efforts to reduce the amount of spiderwort in the garden, it is still cropping up everywhere. I find it lovely early in the season, but must redouble my efforts to keep it under control. The garden is far from perfect, but I do not picture it too far ahead. My garden is a journey, maybe just a playground. At any it works. It is enough. Every time I glanced out the window and glimpsed the garden today, I felt such happiness. 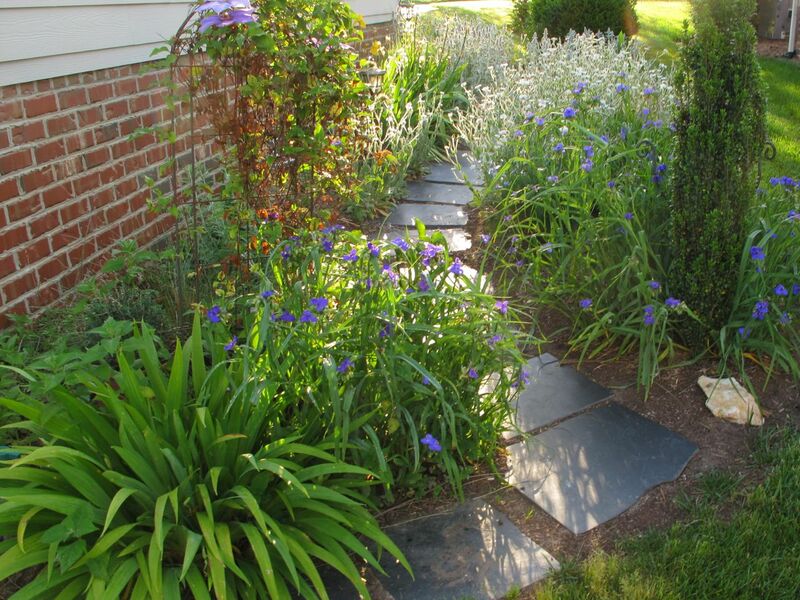 This entry was posted in garden and tagged almanac, black iris, garden photography, spiderwort on May 19, 2013 by pbmgarden. 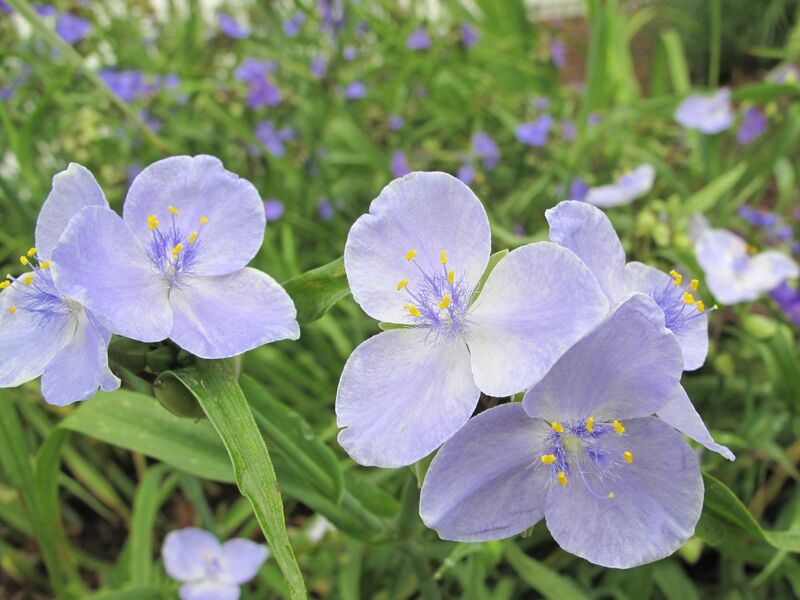 Tradescantia (Spiderwort) pops up all over the place often with subtle color variations. This deep red-violet is one that caught my attention early this afternoon. This little insect also found it interesting. 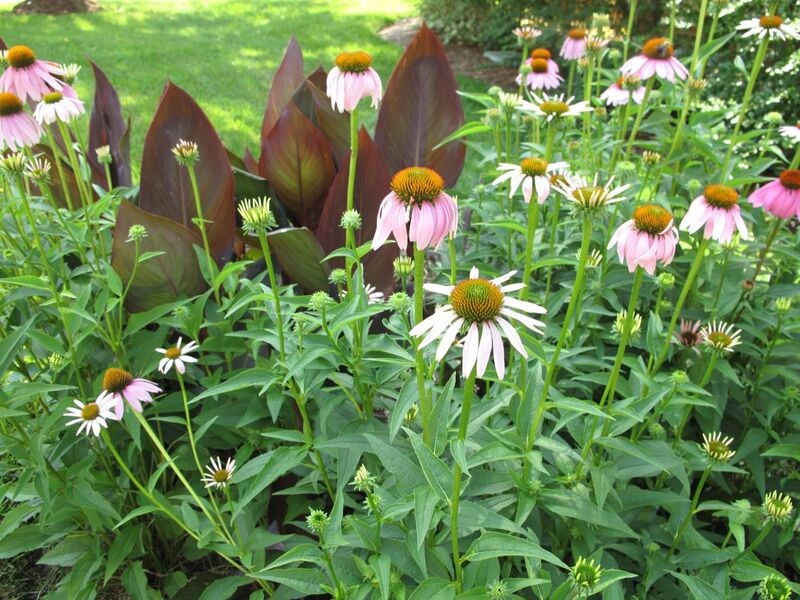 It is well into November and some perennials continue blooming, mostly Echinacea. Pale yellow Chrysanthemums still brighten the southern border and Camellia sasanqua ‘Yuletide’ and one unknown sasanqua are laden with fragrant flowers. Rosa ‘Iceberg’ has been lovely for several weeks. 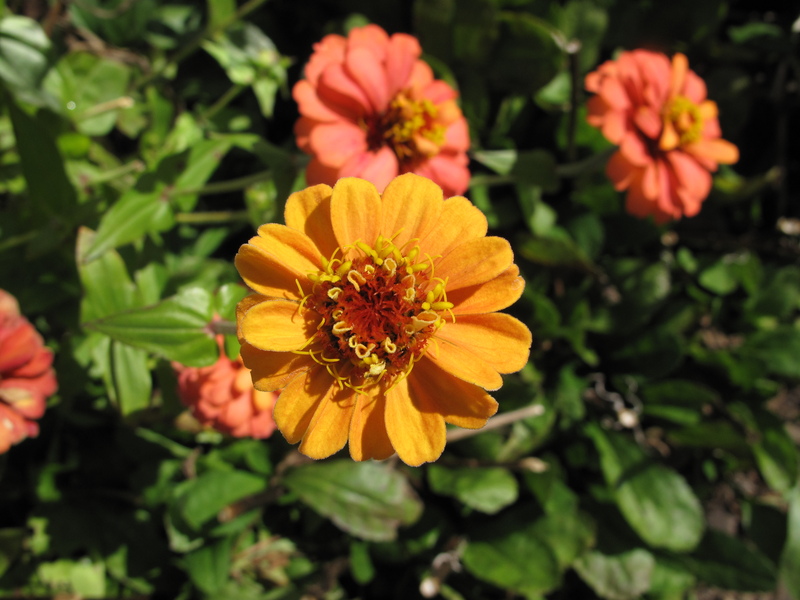 Several camera-shy butterflies visited the last of the zinnias today. 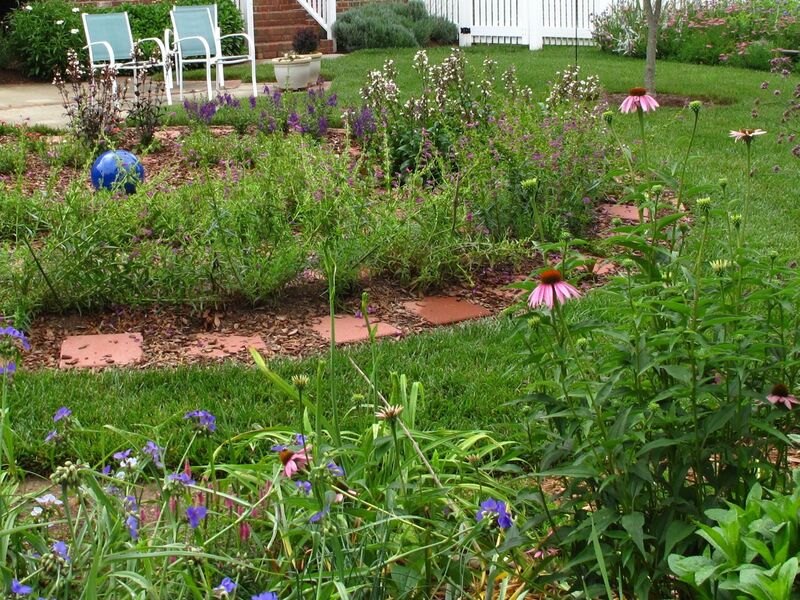 Recently opportunities to spend even a few minutes in the garden have been rare. 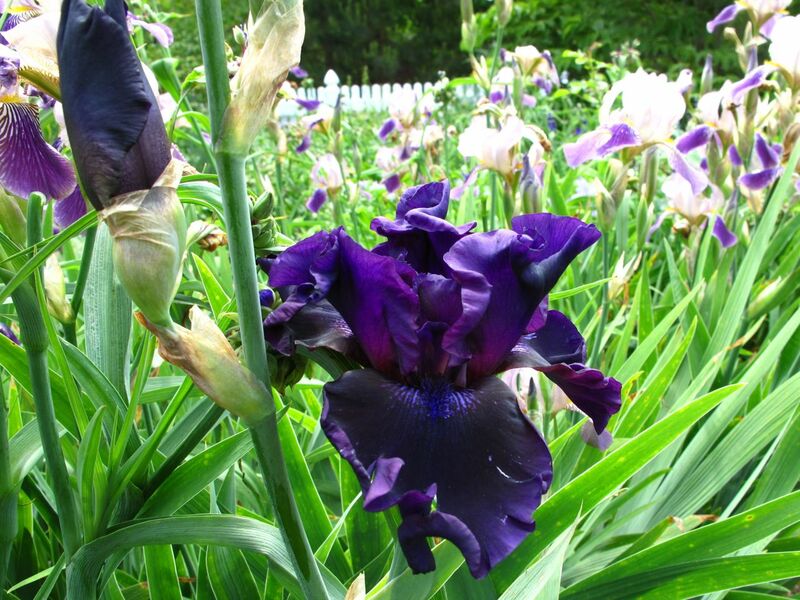 There are still many autumn tasks to complete—irises and daffodils to plant, weeding and mulching to finish. The garden is not waiting on anyone to get a list of chores done. It is shutting itself down gradually and gracefully, as if ready for a nice rest. There has been no rain for a few weeks. 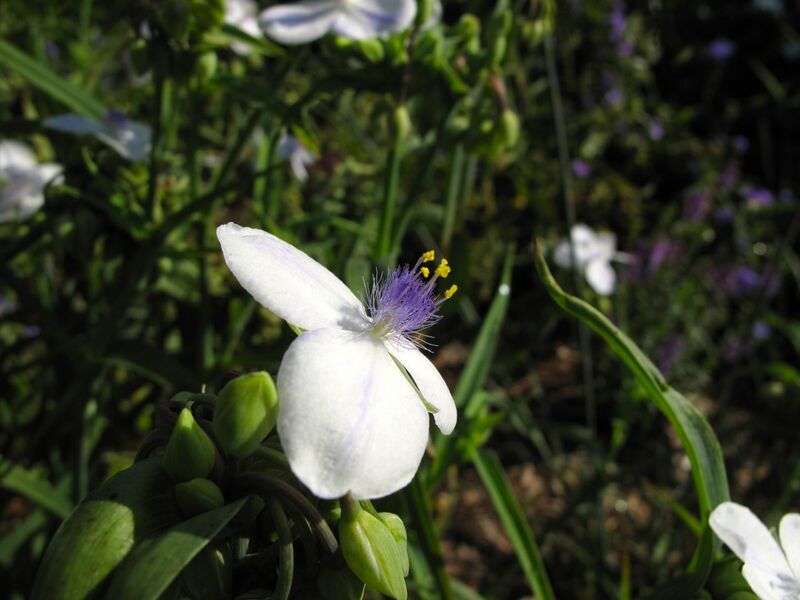 Several light frosts have left the thyme in the meditation circle briefly coated in white, but today was a warm and sunny 73° F.
This entry was posted in garden and tagged almanac, late fall garden, spiderwort, tradescantia, zinnia on November 11, 2012 by pbmgarden. Early this morning Echinacea purpurea (Purple Coneflower) and Canna waited in the shade as the sun slowly moved to warm these sun-loving perennials. 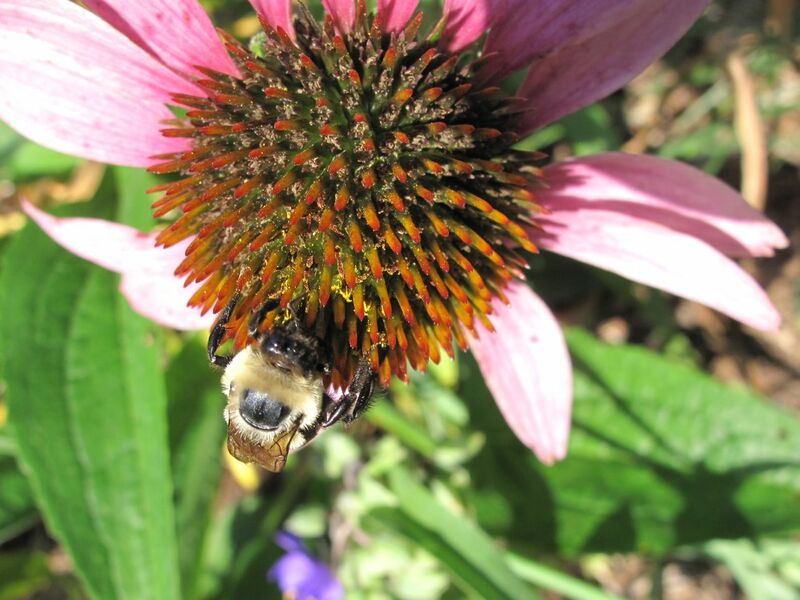 Echinacea purpurea is native to Eastern USA and bees find it attractive. Later American Goldfinches will enjoy its seeds. 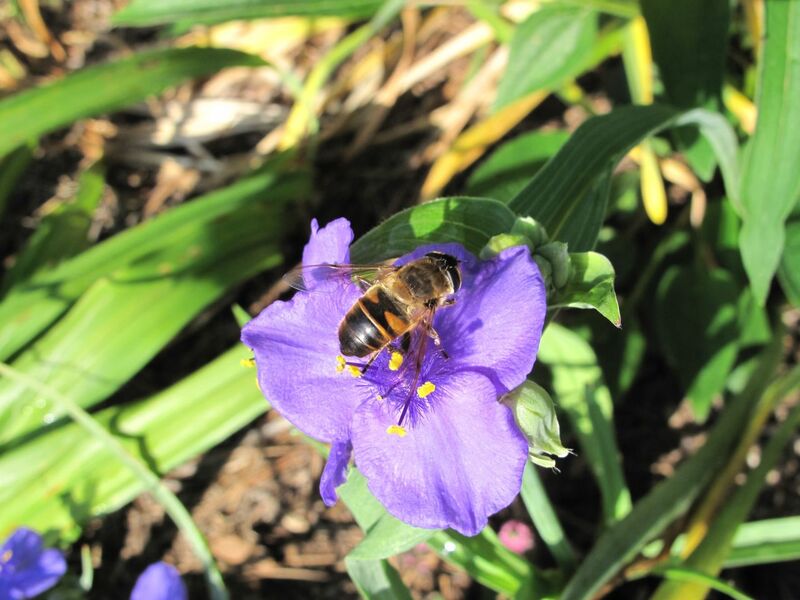 While it still can this bee should enjoy the Tradescantia (Spiderwort) that abounds in the garden. This week I am making some progress in cutting it back, but am finding it difficult work to remove it by the roots. Although afternoon temperatures reached 92 degrees, the garden this morning was pleasant and mostly shaded, perfect for welcoming visitors to view the flowers. So when a neighbor and her friend walked by while I was taking pictures in the front side garden, I eagerly asked them to come to the back to see my garden. This year, more than in any other year, I have felt comfortable with the state of the garden overall and am happy when I can share this place. 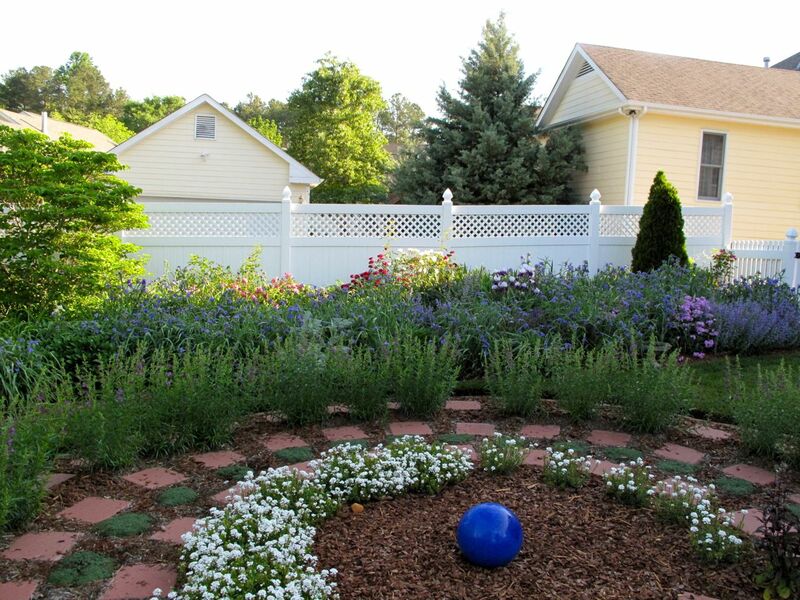 It is not perfect, of course, but some key garden renovation projects during the last year have made the garden much more cohesive and have given it personality. 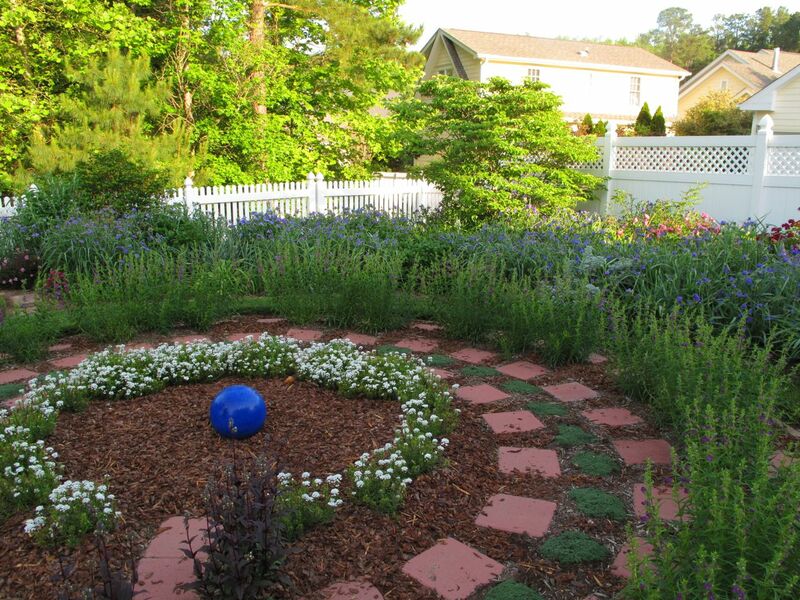 The meditation circle is one such project and today my neighbor’s friend walked the meditation path, experiencing a labyrinth for her first time. It was a nice morning in the garden. 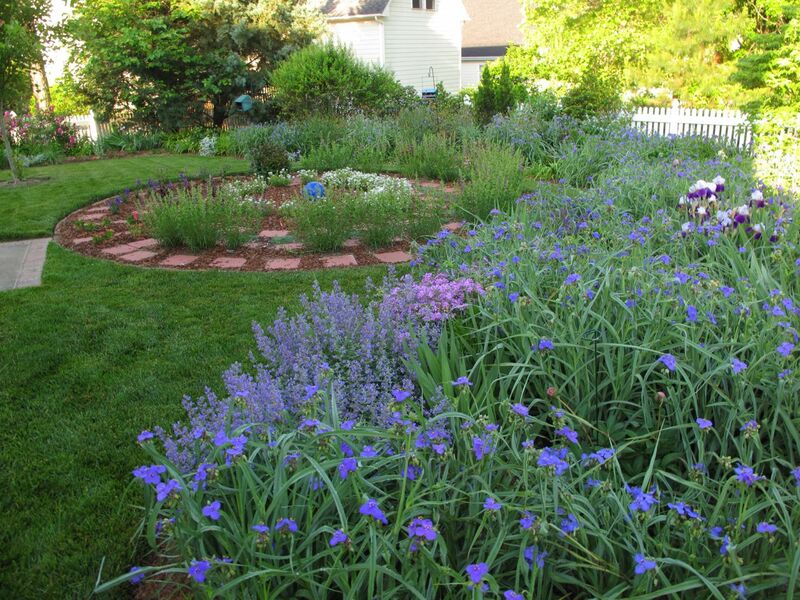 This entry was posted in garden and tagged almanac, bees, echinacea, garden renovation, labyrinth, meditation circle, meditation garden, meditation path, nature photography, perennials, photographing nature, photography, spiderwort, tradescantia on May 31, 2012 by pbmgarden. Temperatures reached 87 degrees and the day felt quite humid and summery. 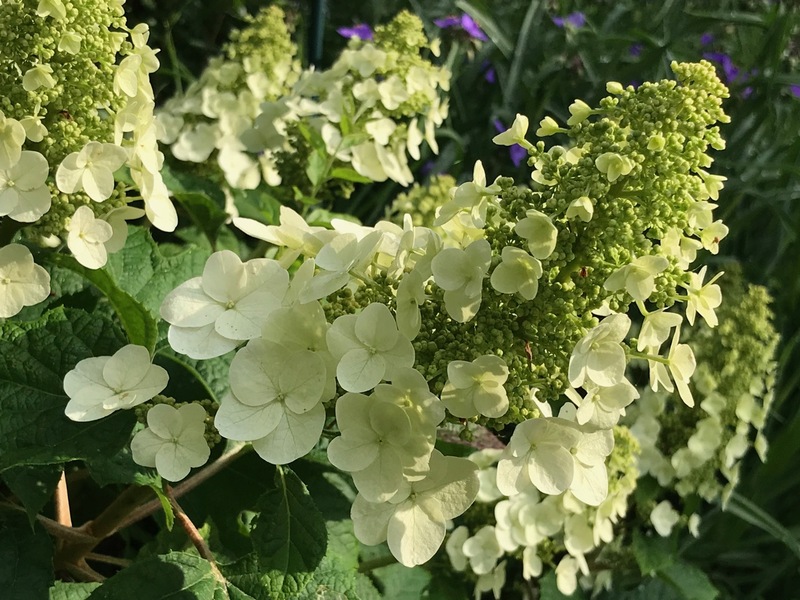 The borders appear full and lush, a tribute to the power of adequate rainfall; however, the first flowering period of many plants is past, so deadheading and trimming are on the agenda for this week. 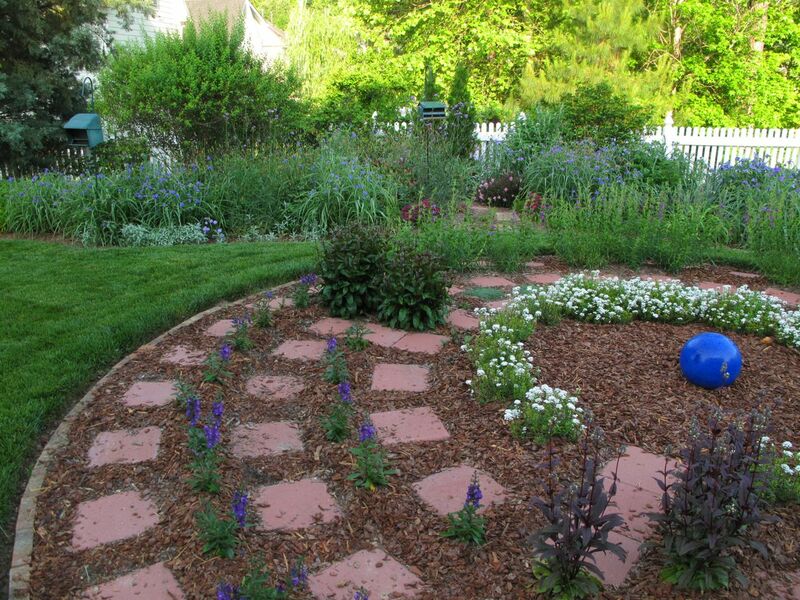 There has been little work done in the garden for the last two weeks, but that must change. 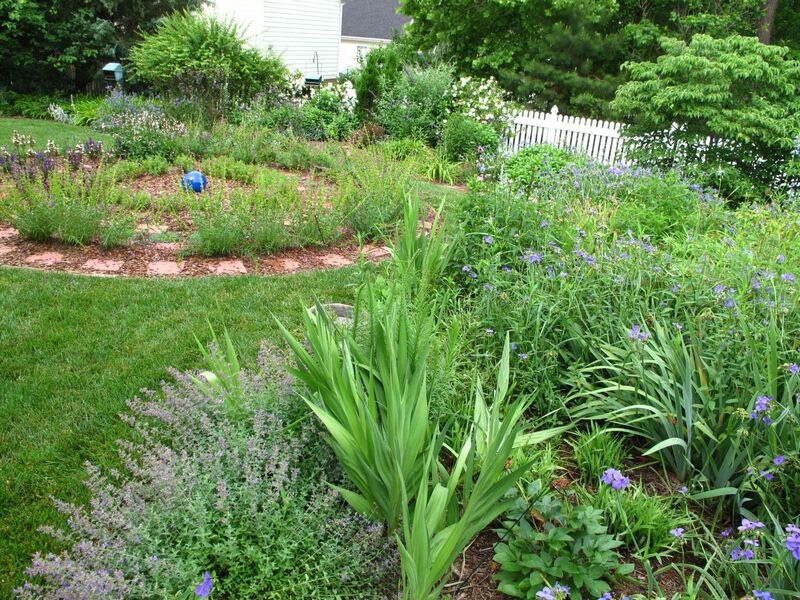 The garden is in transition and is very much in need of attention. 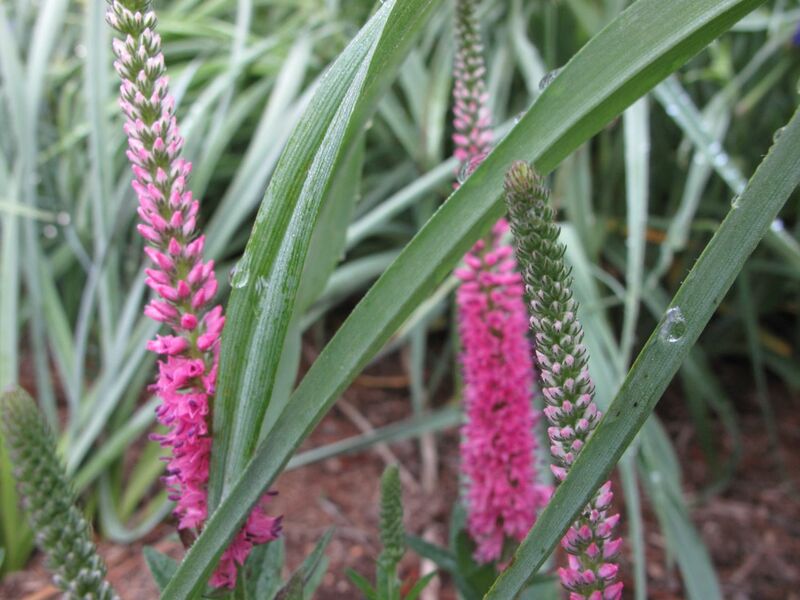 Echinacea, Gladioli, Liatris and Daylily are replacing Iris, Lamb’s Ear and Tradescantia. Shasta Daisy clumps will be covered in bloom any day. 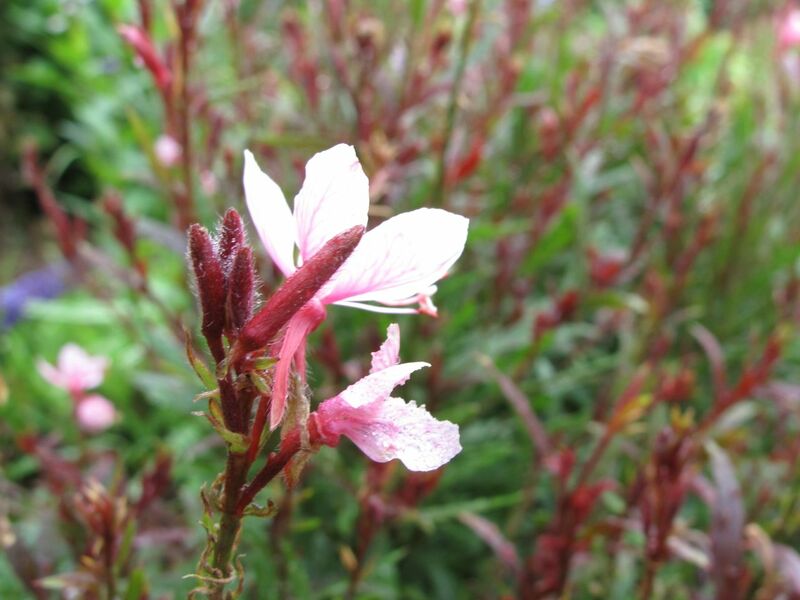 Meanwhile Meadow Sage should be cut back to encourage more blooms. Nepeta may need shearing soon as well. Monarda and Lantana are teasing with a bit of color today. 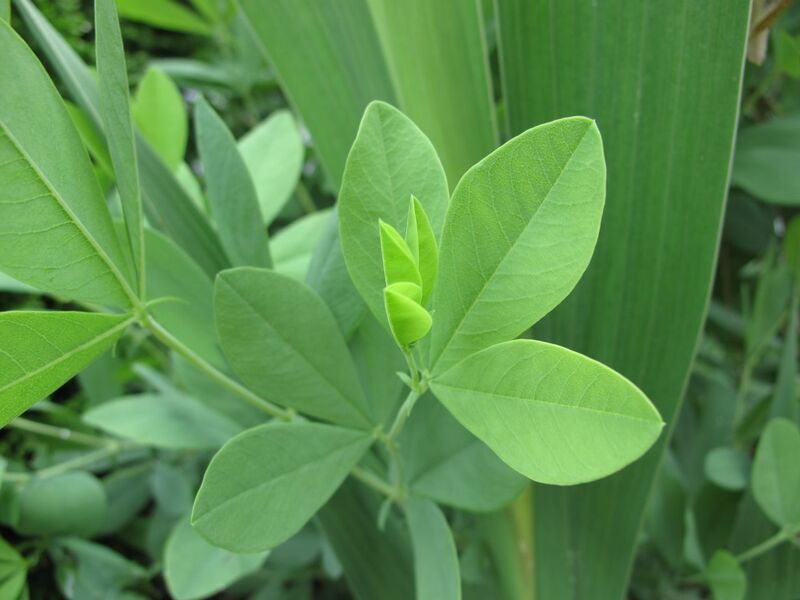 This weekend in town I came upon a large and beautiful planting of Baptisia and Autumn Joy, all in full bloom. In this garden all three baptisias lost their flowers suddenly this year after a just a short bloom time, but the foliage remains healthy and green. Paths in the meditation circle are in some disarray lately. The pine nugget mulch being used this spring is too lightweight to stay in place when rains come. 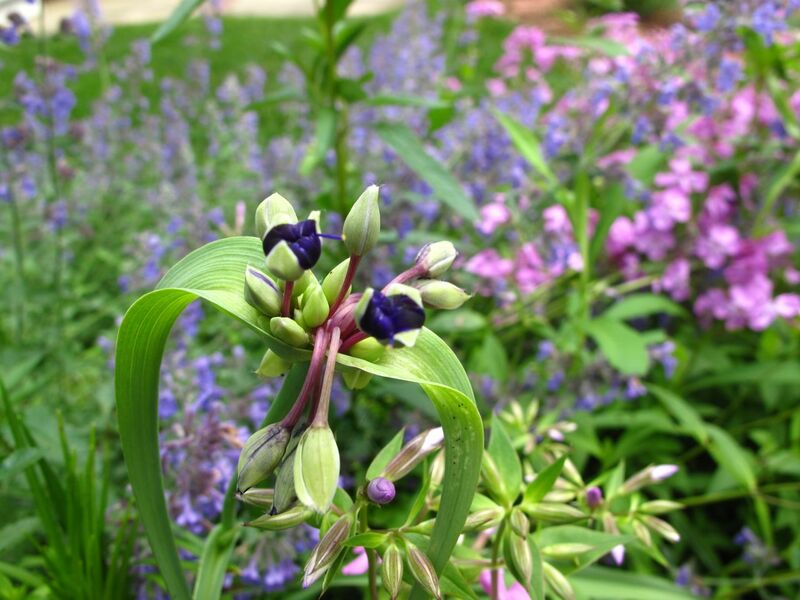 Also the mexicali ‘Pike’s Peak Purple’ Penstemon has sprawled over quite a bit and requires staking again. Penstemon digitalis ‘Husker Red’ is so much better behaved and retains its upright place, (although its self-sown seedlings need to be removed soon). 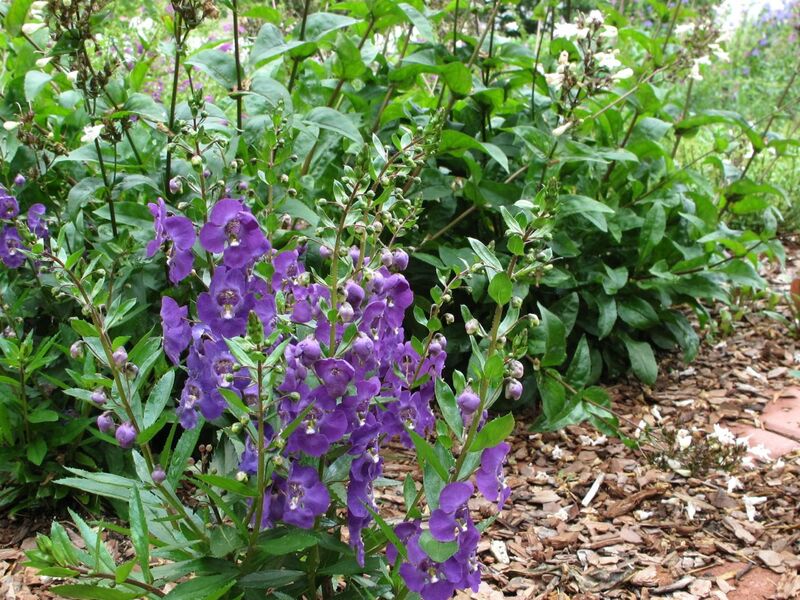 The annual Angelonia ‘Blue’ in the meditation circle has begun to grow now that the weather is hotter. 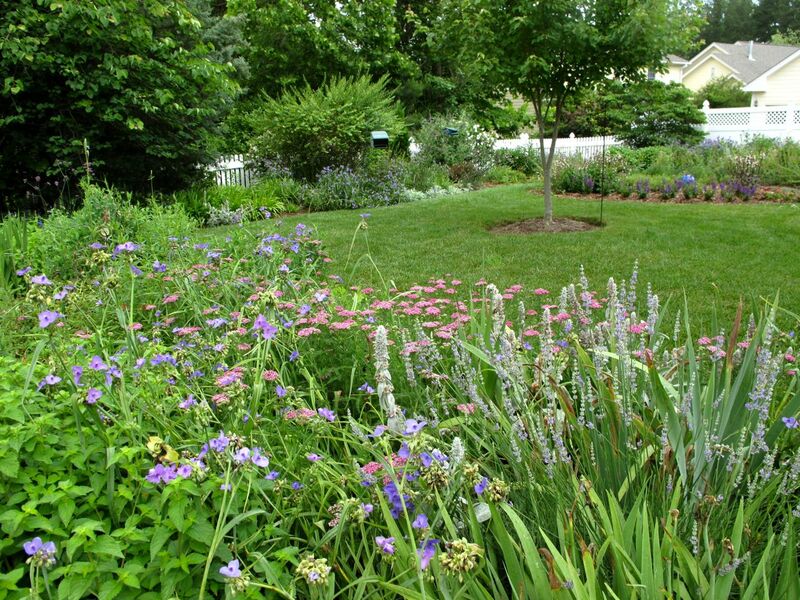 There will be plenty of tasks to keep this gardener busy this week but with an abundance of flowers blooming and the scent gardenia wafting through the air, it should be mostly delightful to spend time in the garden. This entry was posted in garden and tagged angelonia, baptisia, echinacea, gaura, Lamb's Ears, lantana, liatris spicata 'alba', meditation circle, meditation garden, meditation path, monarda, nature photography, penstemon, photographing nature, photography, shasta daisy, spiderwort, tradescantia on May 28, 2012 by pbmgarden.